Operator needs to control pan and tilt of gimbal. 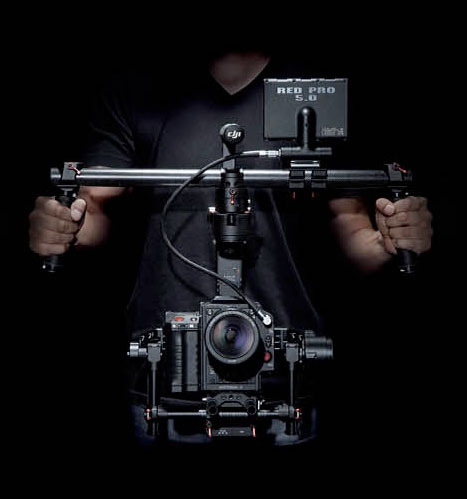 The Ronin Gimbal system comes with radio control and DJI offers a thumb control. Unfortunately, the radio control is impractical for a single operator and the thumb control unit cannot adjust pan and tilt at the same time. Using the Ronin D-Bus connection we can have full control pan tilt and roll via a custom controller. D-bus is DJI’s name for the standard S-bus protocol used in hobby radio control systems. We decided to use and Arduino micro controller to generate the D-bus signal. While researching options we came across this post: https://forum.dji.com/thread-167232-1-1.html . This uses a Nintendo Wii Nunchuck as the input device. There is a prebuilt library available in the Arduino IDE for interfacing with the Nunchuck’s I2C interface. Unfortunately the version of the library has routines for all Wii devices and when code is compiled, consumes more memory than is available on the Arduino Nano.